According to the flight instructor and the pilot-rated student, both believed the airplane had been fueled at the time it was pulled out of the hanger by line personnel, and they had observed a fuel truck parked near the airplane prior to the flight. The student had performed the preflight inspection, during which he interpreted the fuel sight gauges as indicating full fuel; however, he did not visually check the fuel in the tanks. When the instructor arrived at the airplane, he asked the student how much fuel was on board and the student said the tanks were full. The flight departed from Lynchburg, Virginia and made several takeoffs and landings at a nearby airport. About 1 hour into the flight as the airplane was 1,000 feet above ground level, the engine lost all power. As the instructor began a turn toward a nearby pasture, the engine started producing power again and the instructor chose to continue the turn, heading toward the nearest airport. The engine then lost all power again. No longer able to glide to the nearby pasture, the instructor flew the airplane straight ahead and let it settle into the trees. 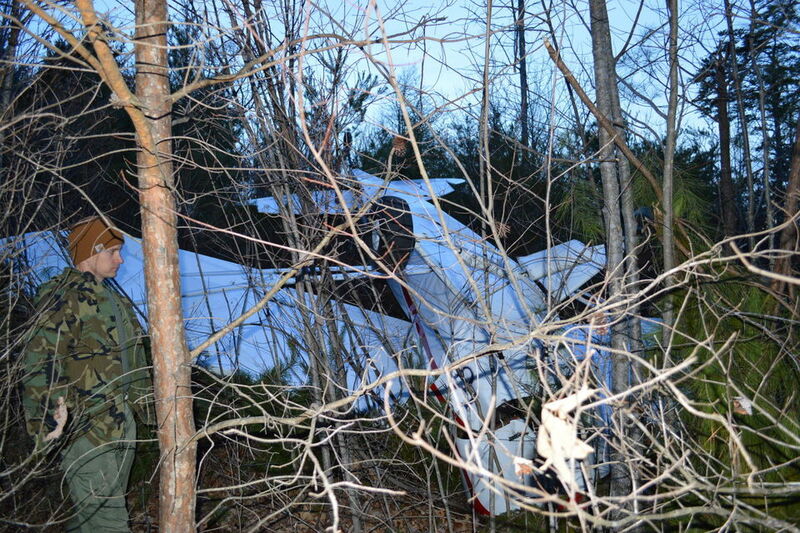 The airplane struck the trees and terrain and came to rest inverted. Examination of the wreckage by a Federal Aviation Administration inspector revealed substantial damage to the wings and fuselage. The inspector recovered about 1 pint of fuel from each fuel tank. Additionally, neither pilot reported any mechanical malfunctions or anomalies that would have precluded normal operation of the airframe or engine. After the accident, the flight school held safety briefings with its instructors, faculty, and students. These briefings included discussion of the circumstances of the accident, and the implementation of policy changes related to pre and post flight responsibilities of students and instructors, new fuel level measuring procedures, and dispatch records of fuel status. These changes were applied to all airplane types and operations at the school, and were subsequently written in the Flight Operations Manual. 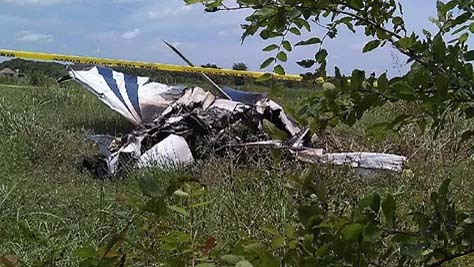 The flight instructor and pilot-rated student's inadequate preflight inspection, which resulted in a total loss of engine power due to fuel exhaustion. According to the flight instructor and the pilot-rated student, both believed the airplane had been fueled at the time it was pulled out of the hanger by line personnel, and they had observed a fuel truck parked near the airplane prior to the flight. The student had performed the preflight inspection, during which he interpreted the fuel sight gauges as indicating full fuel; however, he did not visually check the fuel in the tanks. When the instructor arrived at the airplane, he asked the student how much fuel was on board and the student said the tanks were full. The flight departed from Lynchburg, Virginia and made several take and landings at a nearby airport. About 1 hour into the flight as the airplane was 1,000 feet above ground level, the engine lost all power. As the instructor began a turn toward a nearby pasture, the engine started producing power again and the instructor chose to continue the turn, heading toward the nearest airport. The engine then lost all power again. No longer able to glide to the nearby pasture, the instructor flew the airplane straight ahead and let it settle into the trees. 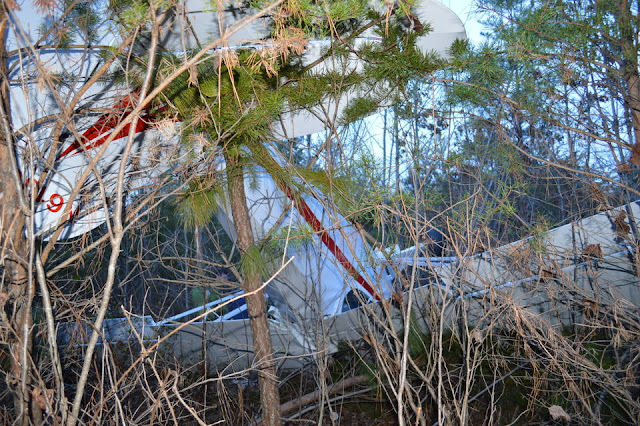 The airplane struck the trees and terrain and came to rest inverted. Examination of the wreckage by a Federal Aviation Administration inspector revealed substantial damage to the wings and fuselage. The inspector recovered about 1 pint of fuel from each fuel tank. Additionally, neither pilot reported any mechanical malfunctions or anomalies that would have precluded normal operation of the airframe or engine. 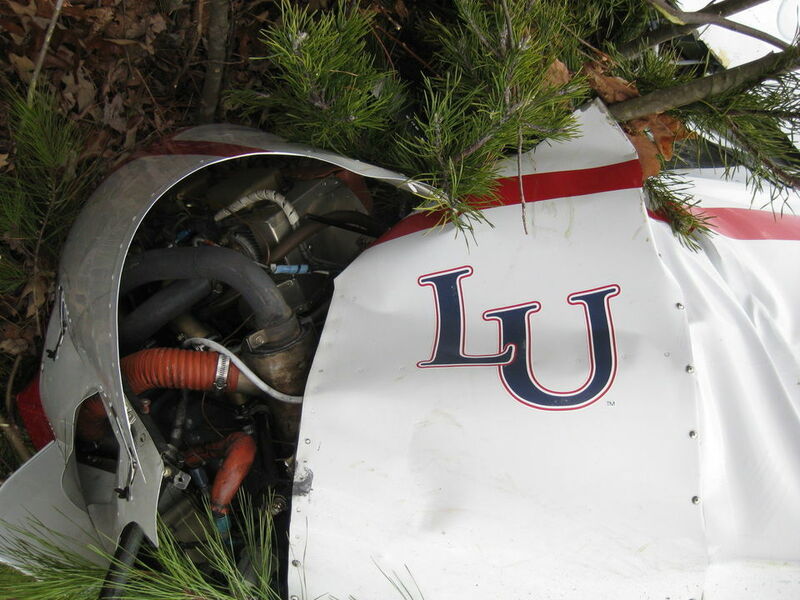 A Liberty University flight-school plane that crashed in a Gladys field during a training exercise early this year didn’t have enough fuel for the flight, according to documents from the Federal Aviation Administration obtained by The News & Advance. 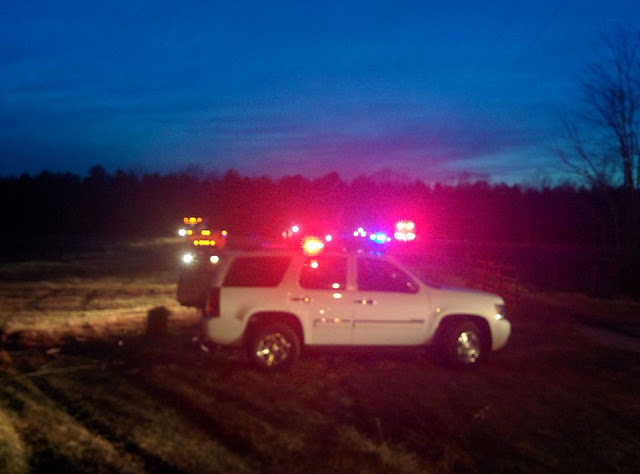 The crash happened in the late afternoon of February 4 while the plane was en route to Lynchburg Regional Airport from the Brookneal/Campbell County Airport. 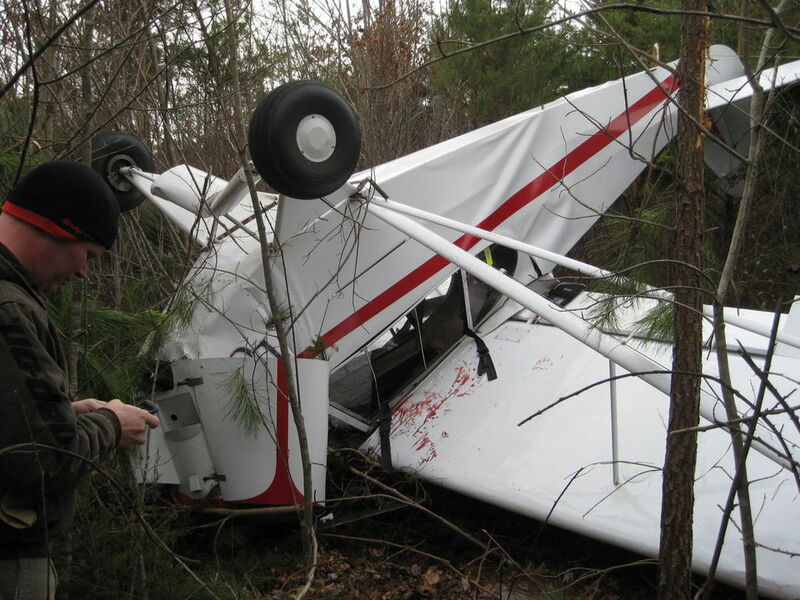 Student Jonathan K. Bass, 22, of Chesapeake, and instructor Bruce Lee Barnhart, 52, of Gladys, said in handwritten statements to the Federal Aviation Administration they were forced to crash-land the plane after it lost power twice. The two-seat, single-engine Piper PA-18 Super Cub hit a tree line and flipped over, finally coming to a stop in a wooded area behind a farm field at 6250 Brookneal Highway. Photos from the scene included in the Federal Aviation Administration documents show the upside-down plane pierced by trees and stained with bloody handprints. Authorities have said Bass received minor injuries during the incident, and Barnhart was unscathed. The cause of the crash was investigated by the Federal Aviation Administration and the National Transportation Safety Board, which still is investigating. Documents from the Federal Aviation Administration show it found Barnhart violated at least one federal aviation regulation in connection with the crash, but the specific regulation was redacted under a public records law exemption. “The flight was operated without having adequate fuel on board. Operations of this type may be contrary to Title 14 of the Code of Federal Regulations,” a February 20 letter from the FAA’s Richmond Flight Standards District Office said. The Federal Aviation Administration closed its investigation April 1, Eastern Region Spokesman Jim Peters said in a phone interview Wednesday. Barnhart completed a “letter of correction” agreeing he won’t violate the same regulation in the future. “It doesn’t affect the pilot’s license or trigger a fine,” Peters said of the violation. Andrew Walton, the flight school’s safety director, wouldn’t comment Wednesday on whether the pilots knew they ran out of fuel, or if the plane’s fuel level display was working properly. “The NTSB investigation is not yet completed, therefore we are not authorized to share certain details. However, I can say that we have worked closely giving our full cooperation to both the NTSB and the FAA. Together, we very quickly identify contributing factors and ensured that LU had the right measures in place to prevent this type of accident from recurring,” Walton said in an email. He confirmed the school keeps records of how much fuel a plane has before a flight, but, citing the investigation, he refused to say how much fuel was recorded in the Piper Super Cub when it initially took off from the Lynchburg Regional Airport on February 4. Flight students and instructors typically spend at least 45 minutes preparing for flights, including a 15-minute walk-around inspection of the plane. That inspection would include making sure there is enough fuel and oil for a flight, Walton said. Each airplane is inspected after every 100 hours of flight by Freedom Aviation, one of Lynchburg Regional’s fixed-base operators. A Freedom Aviation employee wrote in an email to a Federal Aviation Administration investigator that he and other employees went to the crash site Feb. 5 to plan how to remove the aircraft from the trees. The employee, Randy Tucker, wrote there was no fuel, fuel odor or fuel stains near the tanks or on the ground beneath the plane where it crashed. “Upon removing the wings from the aircraft and transporting them from the crash site to the staging area I witnessed approx. 1 pint of residual fuel leaking from either wing,” Tucker wrote in the February 10 email. He declined to comment when he was reached by phone Wednesday. Walton wouldn’t disclose whether Barnhart still instructs at the flight school, but said Bass graduated in May. Walton said neither pilot was available for comment Wednesday. 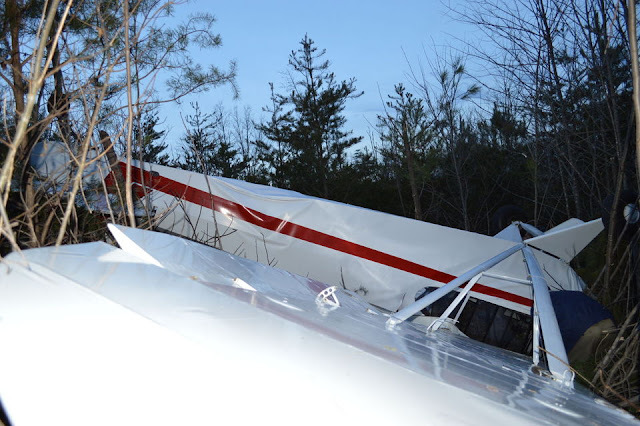 The plane, which was part of the school’s 32-aircraft fleet based in Lynchburg, is “wrecked beyond repair,” Walton said. A military jet experiencing problems with one of its engines landed safely at Midway Airport on Wednesday afternoon, officials said. 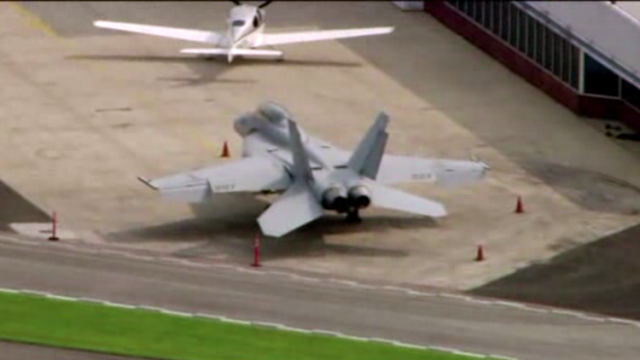 The F-18 landed on Runway 4R around 12:35 p.m. after the pilot radioed air traffic controllers about the engine problem, according to Federal Aviation Administration spokesman Tony Molinaro. The aircraft landed “without incident,’’ Molinaro said in an email. Two people were aboard the jet, and neither was injured, according to Chicago Fire Department spokesman Larry Langford, who said a still and box alarm and an EMS Plan I were called as a precaution. 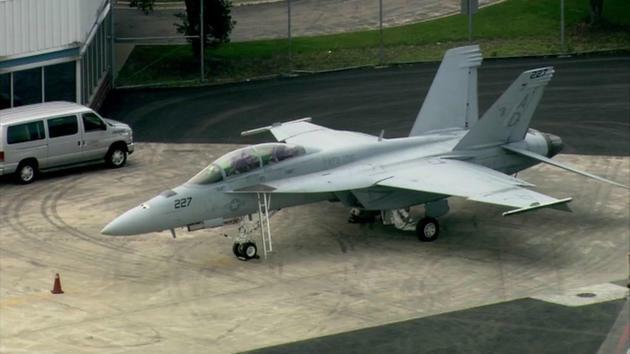 The alarm and ambulance plan were called off at 12:36 p.m. after the F-18 made an emergency landing, said Chicago Fire Department spokesman Chief Juan Hernandez. “They’re designed to run on one engine if it has to,’’ Langford said. 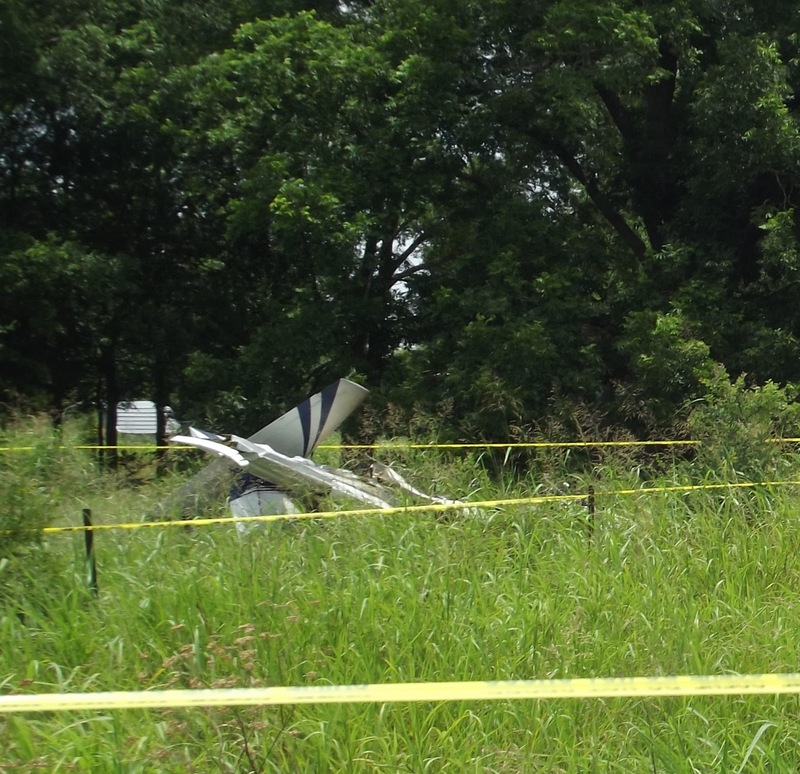 The airplane, which was owned and operated by the private pilot, experienced a total loss of engine power shortly after takeoff, descended, and impacted a field. A fire erupted that consumed the majority of the airplane's cabin and the inboard sections of both wings. The wreckage distribution, ground scars, and crushing of the wing leading edges were indicative of a low-speed nose-down impact and consistent with an aerodynamic stall. Examination of the fuel system revealed the presence of rust and water in both electric fuel pumps and water in the engine carburetor bowl. The examination revealed no other engine or airframe anomalies that would have precluded normal operation. The rust found in the fuel pumps indicated that the fuel system had been contaminated with water for a long period of time. The airplane owner's handbook provided clear and explicit instructions on how to check before flight for fuel system contamination. The pilot's failure to maintain control of the airplane following a loss of engine power during initial climb after takeoff, which resulted in the wing's critical angle-of-attack being exceeded and a subsequent aerodynamic stall. Also causal was the pilot's inadequate preflight inspection of the airplane's fuel system, which resulted in the loss of engine power due to water contamination. On July 1, 2015, about 1354 central daylight time, a Piper PA-24-250 (Piper Comanche), N6168P, experienced a loss of engine power after takeoff from runway 18 (3,120 feet by 60 feet, turf) at Rockin M Airport (T14), Quinlan, Texas and impacted a field. The airplane was destroyed by impact forces and post-crash fire. 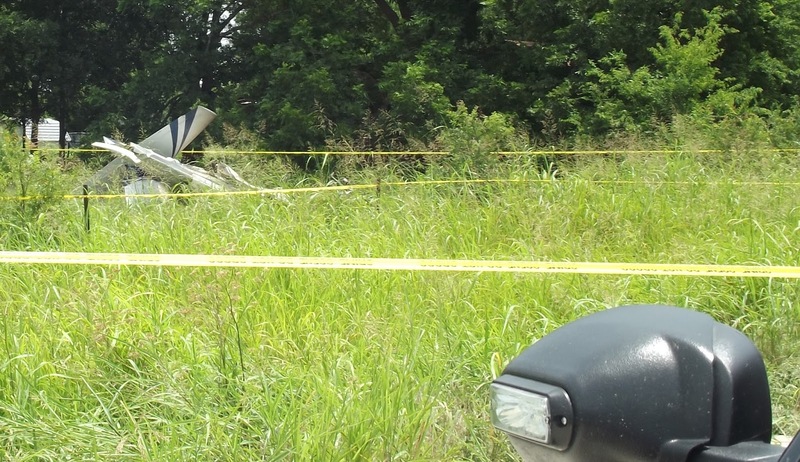 Both private-rated pilots were fatally injured. The airplane was registered to and operated by the pilot under 14 Code of Federal Regulations Part 91 as a personal flight that was not operating on a flight plan. Visual meteorological prevailed at the time of the accident. The flight was originating at the time of the accident. A witness stated that runway 18 at T14 was located about 250-300 yards from the back porch of his house, located west of the airport and slightly north of the runway 18. He said that he could not see the runway 18 due to trees and brush which blocked his view. 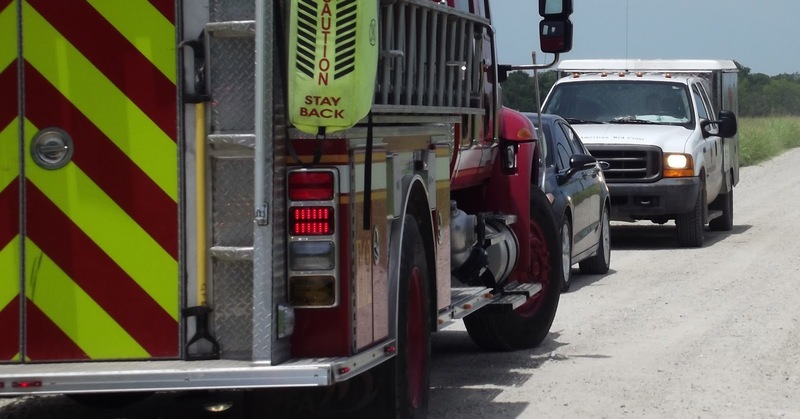 He stated that he was working on his truck when he heard the airplane engine start and run for several minutes and then heard the airplane taxi to runway 18. The engine speed was run up and he heard the engine speed drop slightly as the magnetos were tested. The propeller was cycled three "distinct times" with the engine speed lowered and the propeller blades making a cutting sound as the propeller was cycled. The engine power was reduced and the engine was at idle. About 45 seconds later, he heard the airplane engine accelerate and about 2 seconds later he heard the engine go to what appeared to be full power. He stated that he could tell that the airplane was now moving away from him and the engine sound "sounded very strong." He heard that the airplane was climbing out and heard the engine power reduce and for about 2 seconds he heard what sounded like a cruise climb power setting. The engine sound then went away and he did not hear the engine speed drop off "slowly," he just did not hear anything at all. About 35-45 seconds later, he heard a "thud." He said that he was "impressed at the power" that the airplane was making. The left seat pilot/airplane owner held a private pilot certificate with airplane multiengine land and airplane single-engine land ratings. This pilot reported flight experience that included 4,005 total and 55 hours in last six months as of his last airman medical exam, which was a third class medical certificate and was dated March 7, 2015. The airman medical certificate had the following limitation(s): Must wear corrective lenses. The witness stated that he had flown with the pilot/owner on numerous occasions and was impressed with the knowledge he had of the airplane and the ability to fly it. 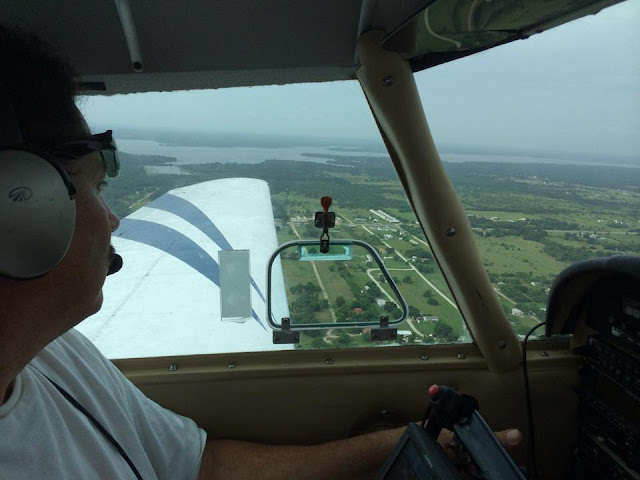 The right seat pilot-rated passenger held a private pilot certificate with an airplane single-engine land rating and a mechanic certificate with an airframe and powerplant rating. He reported accumulating a total flight time of 250 hours and 10 hours in last six months as of his last airman medical, exam dated October 2, 2013, and was issued third class medical certificate with the following limitation(s): None. The 1959 Piper PA-24-250, serial number 24-1269, airplane was powered by a Lycoming O-540-A1A5, serial number L-1112-40 engine, and was registered to the left seat pilot on July 26, 2002. Logbook entries show that the airplane and engine received their last inspection, dated August 1, 2014, at a tachometer time of 4,048.83 hours and a total time since major overhaul of engine, which was dated December 17, 2007, of 849.33 hours. The Majors Airport (GVT) Greenville, Texas automated weather observing system located about 7 nautical miles of T14, recorded at 1355 the following: wind – 190 degrees at 12 knots, visibility – 10 statute miles, sky conditions – clear, temperature – 32 degrees Celsius, dew point – 30 degrees Celsius, altimeter setting 30.01 inches of mercury. The airplane wreckage was about 0.32 nautical miles southeast of the runway center and oriented on a west-southwest airplane tail to nose heading and ground scarring that was approximately contained to approximately the planform of the airplane. The airplane was upright and exhibited crushing along the wing leading edges; the right wing was at about a 45-degree pitch downward angle. The empennage was inverted and along the left side of the fuselage. The landing gear jack screw extension equated to a fully extended landing gear, and the cockpit flap control handle was in the flaps fully extended position. The cockpit fuel selector was positioned to the right fuel tank. Engine control continuity to the cockpit controls was confirmed. The propeller blades did not exhibit S-shaped bending or chordwise gouges/scratches consistent with torsion. On-scene examination of the engine revealed that air was expelled and drawn in through the top spark plug holes with rotation of the propeller with the top spark plugs removed. Engine drive and valve train continuity was confirmed when the propeller was rotated by hand. Rotation of the left magneto produced sparking and the right magneto was unable to be rotated due to thermal damage from the accident. Post-accident examination of the engine revealed a liquid consistent with water within the carburetor bowl, which when tested with Kolor Kut indicated the presence of water. Both fuel pumps exhibited internal brown discoloration and brown material consistent with in color and quantity with long-term corrosion and a liquid consistent with water, which when tested with Kolor Kut indicated the presence of water. The instrument panel was destroyed by impact forces and post-crash fire. The tachometer was destroyed. 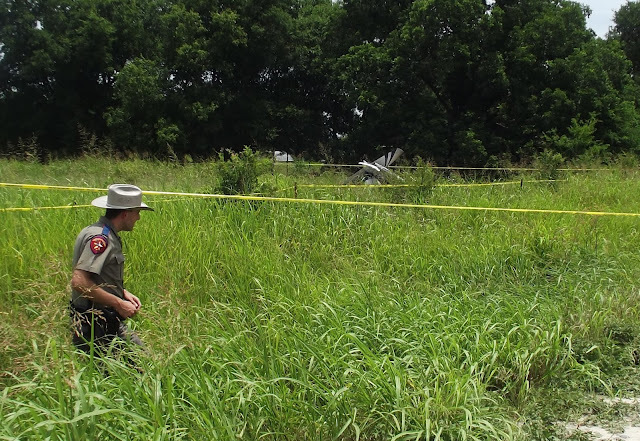 Autopsies for both pilots were performed by the Southwestern Institute of Forensic Sciences at Dallas Office of the Medical Examiner on July 2, 2015 and stated that cause of death for each pilot was blunt force injuries. The Federal Aviation Administration (FAA) Final Forensic Toxicology Fatal Accident Report for the left seat pilot stated: no carbon monoxide was detected in blood, cyanide testing was not performed, no ethanol detected in urine, and no listed drugs detected in urine. The FAA Final Forensic Toxicology Fatal Accident Report for the right seat pilot stated: carbon monoxide testing was not performed due to insufficient sample for analysis, cyanide testing was not performed, 42 (mg/dL, mg/hg) ethanol detected in urine, 19 (mg/dL, mg/hg) ethanol detected in vitreous, and no ethanol detected in blood. Putrefaction was present. "a …The fuel strainer should be drained regularly to check for water or dirt accumulations. "b. The procedure for draining the right and left tanks and lines is to open the easy drain valve for a few seconds with the fuel tank selector valve on one tank. Then change the fuel selector to the opposite tank and repeat the process, allowing enough fuel to flow out to clear water from the fuel line as well as the fuel strainer. The same procedure will apply when auxiliary fuel cells are installed by simply selecting the right and left auxiliary fuel tank." a. Fuel cells should be kept full of fuel during storage and the aircraft refueled as soon as possible after each flight to prevent accumulation of moisture and deterioration of the cells. To drain main and auxiliary cells open the strainer quick drain for ten (10) to twelve (12) seconds with the fuel cell selector on the main cell, then change the selector to the auxiliary cell and repeat the process. Draining each cell for the recommended time should produce a half (1/2) pint or more of fuel per cell. c. All fuel cells are equipped with fuel caps that periodically need to be inspected for proper sealing. In addition, each cell has a filler neck scupper drain tube for water that may collect around the filler neck. These drains should be free flowing with no restrictions. The fuel cell filler cover plate gaskets must also be in good condition and show no evidence of aging, hardening or deterioration. By assuring that the fuel caps are sealing properly, there are no restrictions in the drains and if the cover plate gaskets are in good condition, water contamination of the fuel can be kept to a minimum. d. In order to minimize water contamination of the fuel during cleaning operations avoid directing water into the vents, drain tubes, around sealed cover plates and filler cap access opening." The Piper Comanche Service Manual, Section VIII, further discusses maintenance and cleaning of the fuel system. The PA-24-250 Airplane Owner's Handbook, VI. Fuel System, states in part, "The fuel strainer, equipped with a quick drain, is mounted under the right forward section of the fuselage. The strainer should be drained regularly to check for water or dirt accumulations. The procedure for draining the right and left tanks and lines is to open the gascolator quick drain for a few seconds with the fuel selector on one tank. Then change the fuel selector to the opposite tank and repeat the process, allowing enough fuel to flow out to clear the line as well as the gascolator." (13) The fuel strainer and fuel lines are free of water and sediment by draining all fuel strainers once as day. (14) The fuel tanks and carburetor bowls are free of water and sediment by draining sumps once a week." 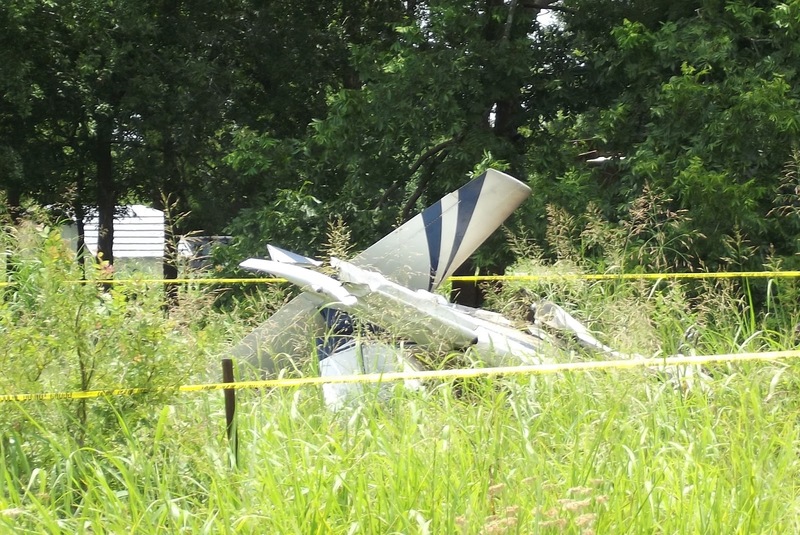 On July 1, 2015, about 1354 central daylight time, a Piper PA-24-250, N6168P, experienced a loss of engine power after takeoff from runway 18 at (3,120 feet by 60 feet, turf) at Rockin M Airport (T14), Quinlan, Texas and impacted a field. The airplane was destroyed by impact forces and post-crash fire. 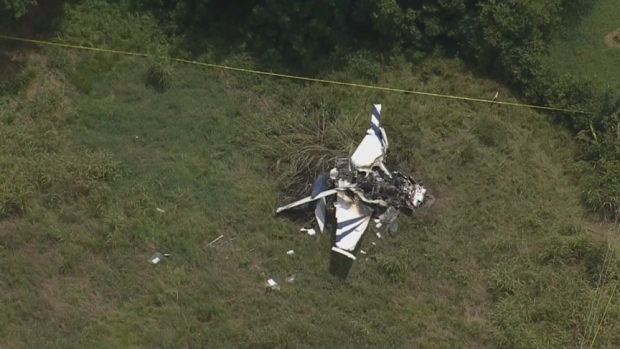 Both private-rated pilots were fatally injured. The airplane was registered to and operated by the pilot under 14 Code of Federal Regulations Part 91 as a personal flight that was not operating on a flight plan. Visual meteorological prevailed at the time of the accident. The flight was originating at the time of the accident. The airplane wreckage was about 0.32 nautical miles southeast of the runway center and oriented on a west-southwest airplane tail to nose heading. The airplane was upright and exhibited crushing along the wing leading edges and airplane nose. The landing gear jack screw extension equated to a fully extended landing gear, and the cockpit flap control handle was in the flaps fully extended position. QUINLAN — Walter Stewart Meziere Jr., 54, of Quinlan, joined our Lord and Saviour on Wednesday July 1, 2015. Walt is survived by his bride, Chellie Feathers-Meziere; daughter Sheena Meziere James, son-in-law Zachary James, granddaughters Kendall, Madison and Ava; daughter Lisa Meziere; stepson Skylar Sheff, stepdaughter Courtnie Sheff; father Walter Stewart Meziere Sr.; mother Allie Wright Metoyer; stepfather Donald Metoyer; mother-in-law Roberta Feathers; brothers Rodney and Jonathan Meziere; sisters Claudine Meziere-Metoyer, Judi Meziere, and Penny Meziere-Clayton and numerous cousins, uncles, aunts, nieces and nephews. Walt was born in Pineville and grew up in Natchitoches, La.. Walt’s biggest passion in life was aviation. He could be found working on his private airport visiting with the many aviators who would fly in to say hello or lend a helping hand. One of his favorite things to do was to ferry youngsters in his plane as part of the Young Eagle’s, an EAA program established to develop a passion for aviation in youth. A memorial service celebrating Walt’s life will be Saturday, July 11, beginning at 5 p.m. at the Rockin’ M Airport located at 360 Stinson Lane in Quinlan. McKINNEY (CBSDFW.COM) – Loved ones are remembering two men killed in a plane crash in Hunt County. The Piper PA-24-250 Comanche crashed shortly after takeoff from a private airstrip near Quinlan Wednesday afternoon. Friends and relatives are now paying tribute to Walt Meziere and Joe Livingston, who were both newly married to their wives. Friends like Richards say that’s why Meziere chose to have a medieval-themed wedding when he got married just two weeks ago. Loved ones say both men were experienced pilots. They say Meziere was such an aviation buff that he even owned his own airstrip. It was there where he launched the fatal flight. “Every time he started talking about flying and planes his face would just light up,” Richards remembered. Friends like Richards say they can’t understand what went wrong. Now those who loved the men can only treasure the good times they had together. Two people were killed Wednesday when a plane crashed and burst into flames shortly after takeoff from an East Texas airstrip, sources tell NBC 5. First responders were seen placing two tarps over what remained of the burned out aircraft, indicating there were two victims in the crash. 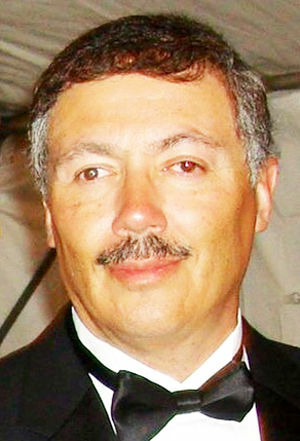 The airstrip's owner, Walter S. Meziere, Jr. of Quinlan, was the pilot of the aircraft. Trooper Kyle Bradford of the Texas Department of Public Safety says Meziere, who was 54, and his 49-year-old passenger, Joe Daniel Livingston of McKinney, were both killed in the crash. 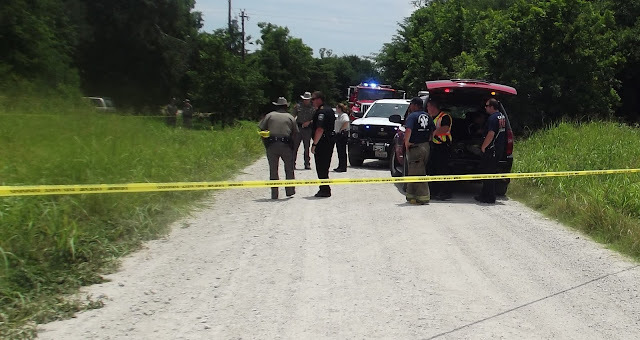 According to Lynn Lunsford with the Federal Aviation Administration, the Piper PA-24-250 Comanche, which can seat four occupants, had departed the private Rockin' M Airport northeast of Quinlan early Wednesday afternoon. Only a few moments later, the plane crashed into a field about 1,000 feet east of the north-south grass runway. The plane came to rest a few yards from a residence in rural Hunt County. UPDATE 7/1/15 @ 8:55 a.m.
BRAXTON COUNTY, W.Va. (WSAZ) -- The search has been officially called off for a possible downed aircraft in Braxton County. The call of a possible downed aircraft came in just before 7 p.m. Tuesday from people who live Millrun area. Crews searched several hours Tuesday night, but never found anything. According to the Braxton County Emergency Management Facebook post, the search was called off early Wednesday after a C-130 from the West Virginia Air National Guard flew a search grid in the area and did not see or pick up a distress signal. 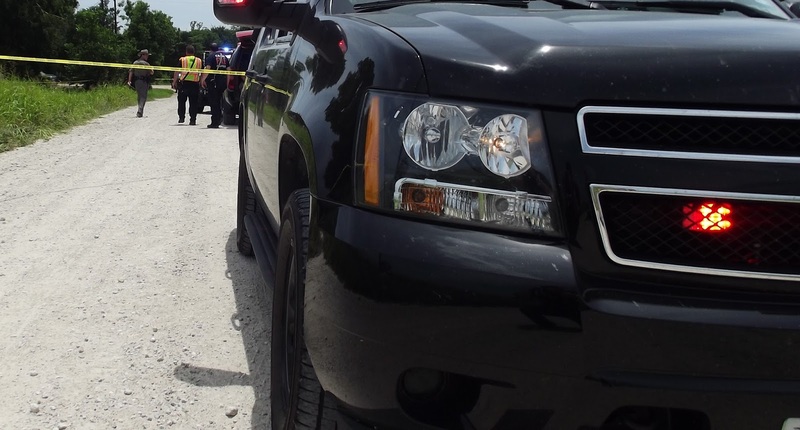 West Virginia State Police, with support from WV National Air Guard and emergency responders from Braxton and Nicholas Counties helped in the search. UPDATE 7/1/15 @ 12:10 a.m.
BRAXTON COUNTY, W.Va. (WSAZ) -- A search for a possible downed aircraft in the Frametown area was called off just before midnight Tuesday. Crews searched by air and foot and found nothing. They say the terrain is so rugged it's difficult to even access it with four-wheelers. High water in a nearby creek also presented challenges. The call of a possible downed aircraft came in just before 7 p.m. Tuesday from people who live in the area. ORIGINAL STORY 6/30/15 @ 10:05 p.m.
BRAXTON COUNTY, W.Va. (WSAZ) -- A report of a possible aircraft down in the Frametown area of Braxton County has emergency crews out Tuesday night searching for wreckage. The call came in just before 7 p.m. Tuesday from people who live in the area. However, Mike Baker, the director of Emergency Management and 911 in Braxton County, says nothing has been found and there is no confirmation of the report at this time. Crews are searching in wooded areas near Frametown along Mill Creek Road. Braxton County emergency crews ended a search for a possible downed aircraft Tuesday night. Dispatchers tell 12 News they received several calls from residents in the Strange Ridge area about a possible aircraft wreck. Residents said they saw helicopters trimming trees in the area earlier in the day. "You could see the helicopter burning, you could smell it. You could smell the paint burning on it. Me and my wife went home, which is right down the road the other way because they had people here," said Eugene Fisher, a Strange Creek resident. Search crews ended their search around 11:30 p.m. and found no wreckage. "I mean, you're out there, looking for something trying to save a life or whatever and you're in the woods and you can't find anything. Yeah, it's very frustrating," said Roger Hall, assistant chief of the Servia Volunteer Fire Department. Officials said search crews may begin another search Wednesday morning. The Federal Aviation Administration and the National Transportation Safety Board said they have no knowledge of any downed or missing aircraft. The search for a potentially downed aircraft has been called off Tuesday night, according to Braxton County officials. Braxton County officials tell 12 News a search is underway for an unknown aircraft that has possibly gone down. The search is in the Frametown, Mill Run or Servia areas of Braxton County. The FAA or NTSB tell 12 News they have no knowledge of any down aircraft in the area. TRAVERSE CITY -- Guardsmen with Coast Guard Air Station Traverse City made a lifesaving rescue Tuesday on Beaver Island. An 86-year-old woman who was on the island needed immediate medical attention and so the Coast Guard came in to save her. The cloudy weather conditions made it nearly impossible for a plane to get into the airport and a boat would have taken too long to get the woman to the main land, so the Coast Guard used a helicopter to rescue her. “Things went smoothly, we worked as a good crew,” said aviation survival technician, Derek Johnson. Around 2 p.m. a full crew of two pilots, a rescue swimmer and a flight mechanic rescued an 86-year-old woman who needed immediate medical attention on Beaver Island. Medical evacuations aren't common for guardsmen in Traverse City. Within the last year they've only had about five, but cloudy weather conditions made it difficult for anyone else to get onto the island. “In this particular situation the weather at Beaver Island and the nature of the stress of the patient prevented them from being taken by boat to mainland and it was difficult for an aircraft to get into the island to extract the patient to the hospital so we used our low level flying route to get into the airport at Beaver Island,” said Smith. “The ceiling started coming down so it was pretty challenging weather to get into Beaver Island,” said Johnson. They said it's important they train for these situations because it can make the difference between life and death. “If the situation is where we're the only ones that can get in there we need to know how to do it safely so we train for it and we got it done to make sure we know how to do it right,” said Smith. The woman was taken to Munson Medical Center but her condition at this time is unknown. FRANKFURT—Lawyers representing some of the families of those killed in the Germanwings crash on Tuesday criticized Deutsche Lufthansa AG’s offer of compensation, calling it far below an appropriate level. Lufthansa has offered the families of German victims €25,000 per passenger ($27,880), plus €10,000 for each immediate next of kin, to cover immaterial damage. That brings the total minimum compensation per victim to €85,000, including the €50,000 Lufthansa offered each family to cover material costs immediately after the crash. The airline also put aside larger sums in the form of trusts for the future needs of victims’ families. The March crash killed 150 people, including Germanwings co-pilot Andreas Lubitz, who prosecutors say deliberately crashed the plane in the French Alps. The plane was en route to Düsseldorf from Barcelona, with predominantly German and Spanish passengers on board. Lawyers for the victims’ families criticized the compensation as inadequate. Elmar Giemulla, a Berlin-based lawyer who represents 34 German families, said he would contest it. Christof Wellens, who represents another 31 German and non-German families, also called the offer insufficient. He also plans to challenge it and will look into legal possibilities if Lufthansa declines to negotiate. There were people of various nationalities on board, including U.K. and U.S., opening the possibility of pursuing cases outside Germany, he said. Lufthansa stressed that the €25,000 and €10,000 sums cover only immaterial damages, such as pain and suffering. It would settle material needs individually, possibly on top of the €50,000 paid after the crash, and in compliance with the German victims compensation act. Lufthansa’s offer may also apply to non-German victims whose claims will be settled according to German law. Claims by Spanish victims will be settled based on Spanish law, Lufthansa said. It is still unclear how victims with other nationalities will be treated. “It is still open whether for U.K. or U.S. victims their national legislation applies,” said Michael Niggemann, chief lawyer of Lufthansa. Compensation for families following airplane crashes fluctuate widely, depending on the country and circumstances. In the U.S., settlements are generally higher than in Europe. Lufthansa said it would set up a €7.8 million fund to support the education of the children of victims. A further €6 million is available for individual needs, with payments to be determined by a board of trustees. In addition, Lufthansa will set up memorial sites in four locations. Lufthansa in April set aside around $300 million in connection with the crash. It said that amount was based on preliminary assessments and can be adjusted. It includes compensation payments to passengers’ relatives, the hull insurance value of the aircraft, accident support and investigation service at the crash site, and legal support and assistance. The payment for the destroyed aircraft will be handled by a separate consortium of insurers. Lufthansa defined next of kin as parents, biological and adopted children, spouses or significant others with a shared address. However, it wouldn’t rule out that brothers or sisters of victims could be entitled to damage payments. —Sarah Sloat contributed to this article. Southern Illinois University Carbondale’s Jessica Reed, left, and Stephanie Armstrong, right, with their trophies and the plane the two used to win the All Women’s Cross Country 2015 Air Race Classic, June 22-25. SIU-Carbondale's nationally recognized aviation program achieved another milestone this weekend. 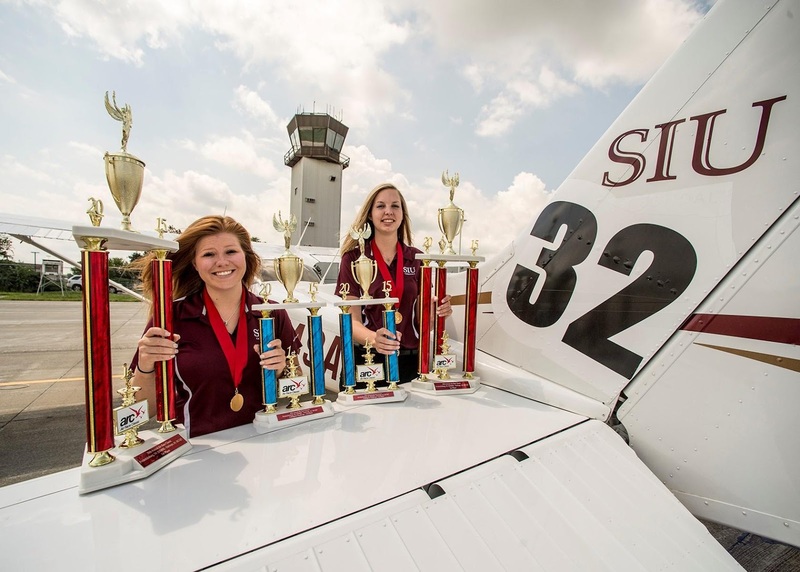 For the first time in program history, an SIU team won the All Women's Cross Country 2015 Air Race Classic. Senior Jessica Reed and assistant instructor Stephanie Armstrong won both the collegiate and overall title in the 39th annual event. After the Flying Salukis won the national collegiate championship in May, Armstrong told us it's wonderful that females have a chance to succeed in a male-dominated industry. The Air Race Classic covered nearly 2,200 nautical miles with nine legs. Scores are based on a plane's projected versus actual timed performance. The event continues a tradition started with the 1929 Women's Air Derby, where famed aviator Amelia Earhart and 19 other female pilots flew from Santa Monica, California to Cleveland, Ohio. Reed flew about 85 percent of the event; Armstrong handled navigation and communications. Fifty-four teams competed for the overall title, including 17 collegiate teams. A second SIU team made up of Sarah Demkovich, a graduate assistant from Algonquin, and Emily Frasca, a May 2015 graduate in aviation management from Champaign, was 24th overall and seventh in the collegiate division. Robin Hadfield, left and Lin Caywood departed the Frederick Municipal Airport June 19. The women piloted Caywood's plane and finished in third place in the 39th Annual Air Race Classic, a 2,529 mile airplane race. After 2,530 miles and stops in almost every state east of the Mississippi River, a Frederick woman took home third place in the 39th annual Air Race Classic. Lin Caywood flew her plane across the finish line just before noon on June 24, only 2 1/2 days into the four-day race. “We think we made some good decisions,” Caywood said of her team, reflecting on their journey. Caywood and co-pilot Robin Hadfield, of Canada, were worried that bad weather would cause trouble during the race, but it was all smooth sailing despite a tornado warning after they landed in Kalamazoo, Michigan. After long stretches of flying in a stifling aircraft, the team was most impressed by the enthusiastic and supportive hospitality from the people at every stop they made. 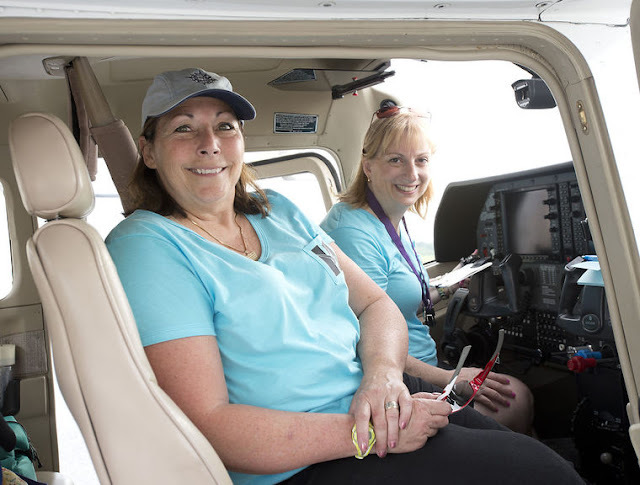 “They really went over the top to make us welcome,” said Caywood, a member or the Sugarloaf Chapter of the Ninety-Nines International Organization of Women Pilots. In Hickory, North Carolina, they were greeted by cheering crowds and mascots from local sport teams, and Union City, Tennessee, won the prize for best stop during the race as they offered manicures and pedicures, shirts and flip-flops, and barbecue for the teams. Caywood and her co-pilot decided not to linger at this stop and flew to the next, which was a good decision considering the bad weather that plagued some of the teams behind them. Although Hadfield started flying planes in 1979, this was her first time in the Air Race Classic. She said she has wanted to do it for years. Hadfield said she enjoyed the race and the camaraderie among the women competing from different chapters of the Ninety-Nines International Organization of Women Pilots. Hadfield said she plans to recruit more women for the race when she lands back in Canada. Krystal Felderman (left) of Cary and teammate Casie Schaffer are seen in Fairhope, Alabama, after participating in the Air Race Classic, an annual transcontinental air race for female pilots. 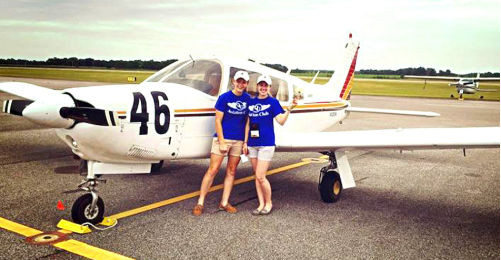 Two local women began their summers by traveling to various parts of the country, and as young pilots who participated in this year’s Air Race Classic, they flew themselves. A nonprofit organization, Air Race Classic Inc., coordinates an annual transcontinental air race for female pilots. This year’s collegiate section included two McHenry County natives, 20-year-old Krystal Felderman of Cary and 21-year-old Sarah Demkovich of Algonquin. The two, from different schools and separate teams, recently finished the race and are headed home this week. Felderman, who grew up listening to stories about her great uncle who was a fighter pilot during World War II, said her interest in aviation led her to Quincy University, where she just finished her sophomore year. She said this was the first time her school sent a team to the Air Race Classic. The route – about 2,400 miles in length, according to the organization’s website – had teams start in Fredericksburg, Virginia, and end in Fairhope, Alabama, with stops in Pennsylvania, Michigan, Illinois, Missouri and other states in between. For Felderman, flying over the Appalachian Mountains was the best part of the multi-day trip. “That was amazing to see,” she said. 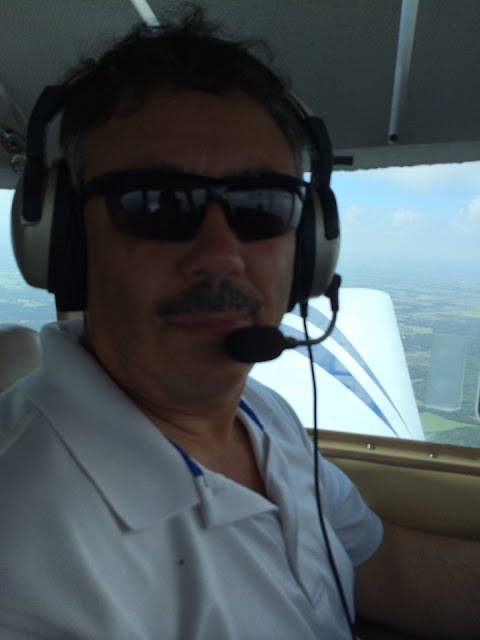 Demkovich, a graduate student and flight instructor at Southern Illinois University, described the various factors pilots had to consider while racing. For one, the teams were not racing against each other, but, essentially, against the best speed of their own plane. While flying from one take-off location to the next destination, teams should think about things such as where the weight of their luggage should be to optimize gravitational energy, Felderman said. Being able to evaluate weather conditions obviously is an extremely important factor, too, Demkovich added. Demkovich and her teammate placed 24th out of the 56 teams. While it was more “middle of the run” than what they were hoping to achieve their first time participating, she appreciated the race as a rare learning experience nonetheless. The pilot reported that during the landing touch down the airplane porpoised, and he elected to abort the landing. The flight instructor stated that the pilot raised the flaps, retracted the landing gear, and pulled back the power at the same time. The airplane descended and impacted the runway. The airplane then veered off the runway to the left and slid until the airplane impacted a canal, which resulted in substantial damage to the fuselage. A plane with three people on board crashed into a ravine near a Solano County airport Tuesday morning, officials said. 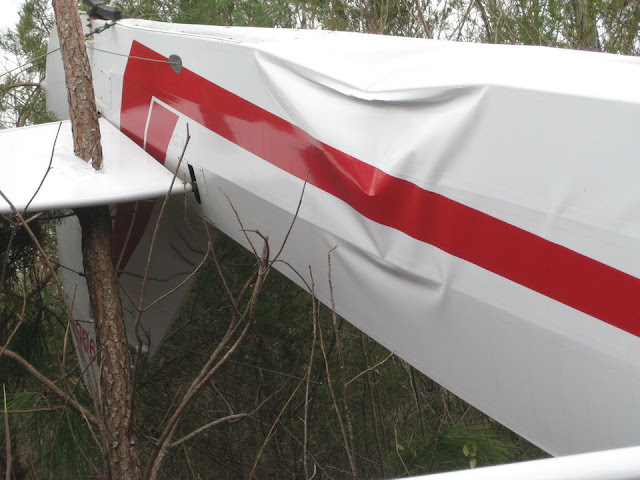 Everyone on aboard the single-engine Cessna 182 was able to walk away, but the plane sustained heavy damage, Rio Vista Public Works Department director David Melilli said. The crash happened around 11 a.m. and the Rio Vista Municipal Airport. Solano County sheriff's Sgt. Jackson Harris said a student and flying instructor were on board. Federal Aviation Administration spokeswoman Lynn Lunsford said the plane went down under unknown circumstances and ended up in a canal. One of three people on board suffered a minor injury, Lunsford said. RIO VISTA, Calif. (KCRA) —A plane with three people on board crashed Tuesday into a ravine near the Rio Vista airport, officials said. 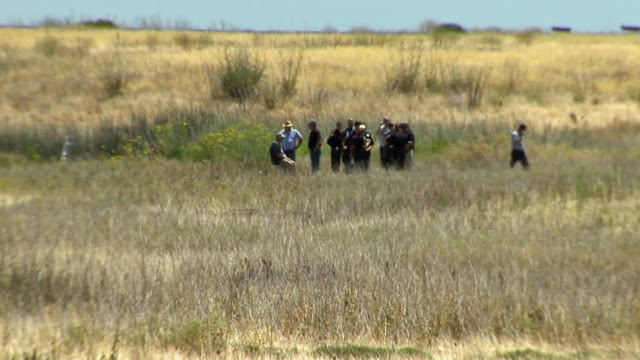 The single-engine Cessna 182 went down about 11 a.m. and was found in a canal near the Rio Vista Municipal Airport, according to the Federal Aviation Agency. Two of the three people were not hurt. The third person suffered a scrape from the crash, but was doing fine, emergency officials said. The plane went down under unknown circumstances, and an investigation into the crash is ongoing. RIO VISTA (CBS13) – A plane has reportedly crashed at the Rio Vista Airport. Around 11 a.m., for unknown reasons, the single-engine Cessna 182 with tail number N739WW went into a canal near Rio Vista Airport, according to a statement from FAA spokesperson Ian Gregor. None of the three people who were in the plane at the time were injured. Fresh off their participation in the Air Race Classic, Lauren Thompson (left) and Kelsey Brown (far right) let us into their world at Aerosim Flight Academy in Sanford. "When I started flying, I started hating to drive!" And with that, we got a pretty good idea that pilot Lauren Thompson is hooked on aviation. For the third year, she competed in the Air Race Classic - a 10-state, 4-day race considered the pinnacle of women's air racing. Her co-pilot is Kelsey Brown, who made her race debut. The women didn't place as well as they wanted to, but they still get to look forward to a congratulations reception for the ground team and sponsors in mid-July. The duo met in ground school, where they both became flight instructors. Before that, Brown majored in French Literature, of all things. But she always knew she didn't want a 9-to-5. "I kept saying that," she said, "and my folks kept saying, 'Well, you know what has all of those options?' And I kept saying, 'No no, no no,'" thinking she'd probably never fly as a career. But all it took was one, 1-hour introductory flight. Her passion and obsession built up even more after completing her first solo flight. "I remember everything being quiet and then all of a sudden, I hear this kind of singing," she recalled. "And then I realized I was the one singing. And it was this realization of, Oh, you are actually doing this right now. And I just thought that was the coolest thing ever." The women led us through a pre-flight safety check during a recent visit to Aerosim Flight Academy, the only flight school originally owned and operated by airlines Comair Airlines and Delta Air Lines. In its 26 years of operation, the academy has issued more than 20,000 licenses and certificates. "It's not a car," Brown said, showing me how to check for the purity of the fuel by removing a sample from inside the wing. "If you have a problem, you can't pull over on the side of the road and get assistance." "It's just awesome, just to be flying," Thompson added. "You look down and just realize, Wow. The views you have, the sunsets, the sunrises are incredible. Just getting to see that and a different perspective, I couldn't ask for a better job." Meanwhile, up next for the public is a "Be a Pilot" open house and career expo. That's happening at Aerosim Flight Academy in October. For information, contact Aerosim at (407) 330-7020. 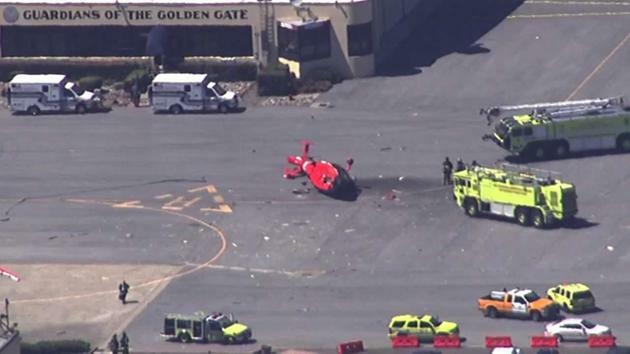 SAN FRANCISCO INTERNATIONAL AIRPORT, Calif. (KGO) -- A Coast Guard helicopter conducting a test flight crashed on an airfield at the San Francisco International Airport, according to Coast Guard officials. Two pilots suffered minor injuries. The rescue helicopter, a MH-65 Dolphin, made a hard landing around 2:50 p.m. Monday as a pilot and a co-pilot were engaged in a maintenance test flight, officials said. The helicopter crashed when pilots lost control as they went to hover to land. The helicopter landed on its side. The pilot and co-pilot were being treated for minor injuries. The incident accident occurred on a tarmac at a Coast Guard facility at the north end of the airport, said SFO spokesman Doug Yakel said. The incident is not affecting commercial operations at the airport.